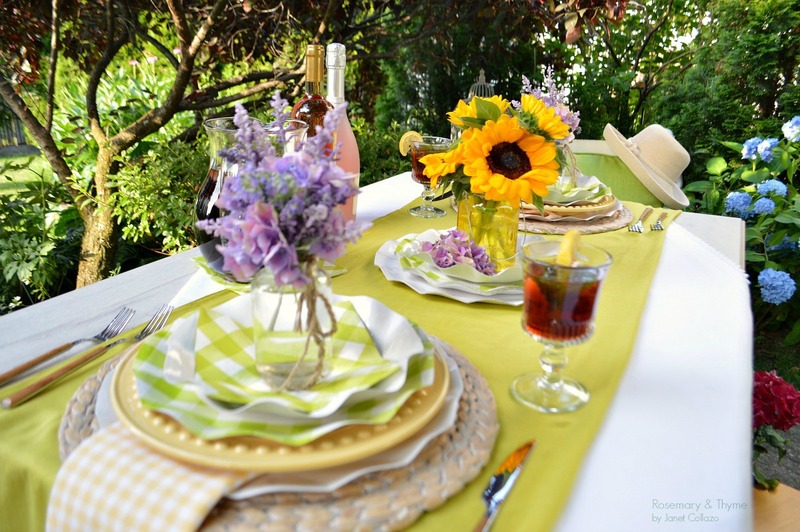 The very mention of the word summer makes me think of slow-paced, enjoying the outdoors and plenty of easy summer entertaining. If you are anything like me, easy does not mean sacrificing style over function. A fuss-free table can still be very stylish and elegant. My friends over at Sophistiplate are ready to help you create a casual yet elegant table with their endless options of disposable paper tableware designed and made in Italy. From basic neutrals, gingham, to pretty ruffled edge designs, these plates will add a touch of elegance to your table for any occasion. My vision for this table was to create a relaxed ambiance with lots of color and texture. I began with the basics! 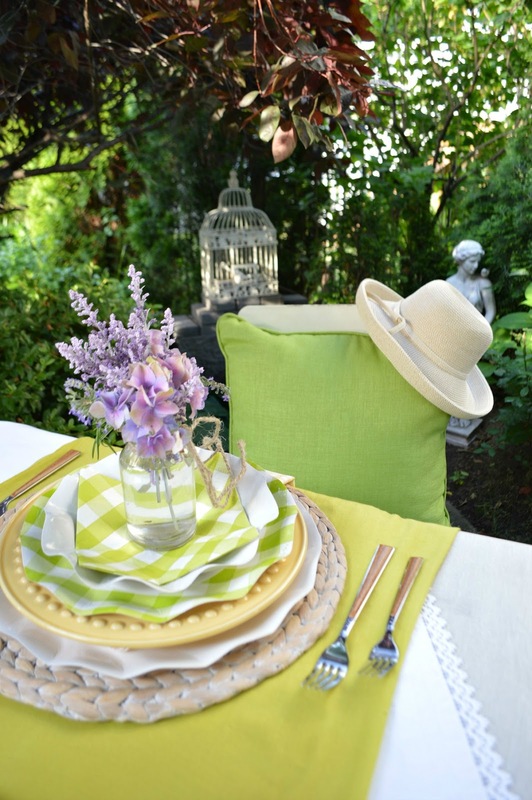 A white table cloth and lime green runner on the center of the table. I also mixed a few of their pieces which included a white plate charger, lime green gingham ruffled dinner plate, white ruffled salad plate and topped it with a lime green gingham napkin to add an element of fun to the table. 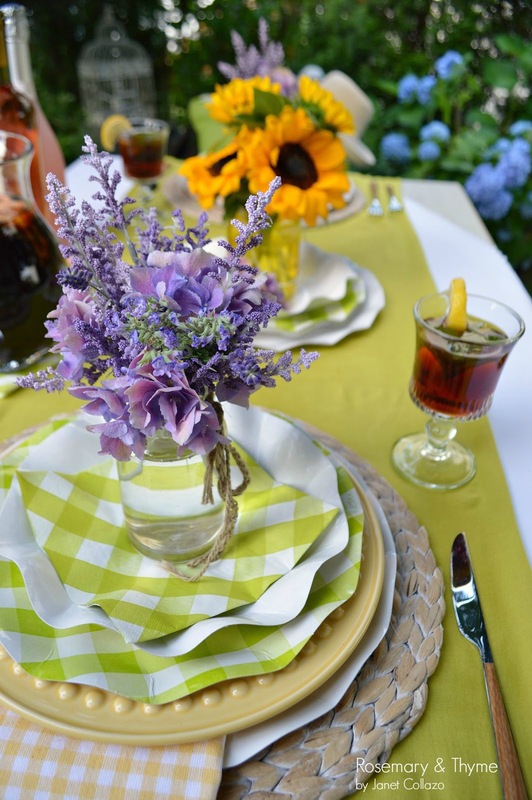 At each place setting, I placed a few pretty blooms in hues of purple inside of a simple mason jar to give the table interest and a sweet summer detail. This choice of color makes the lime green truly stand out. 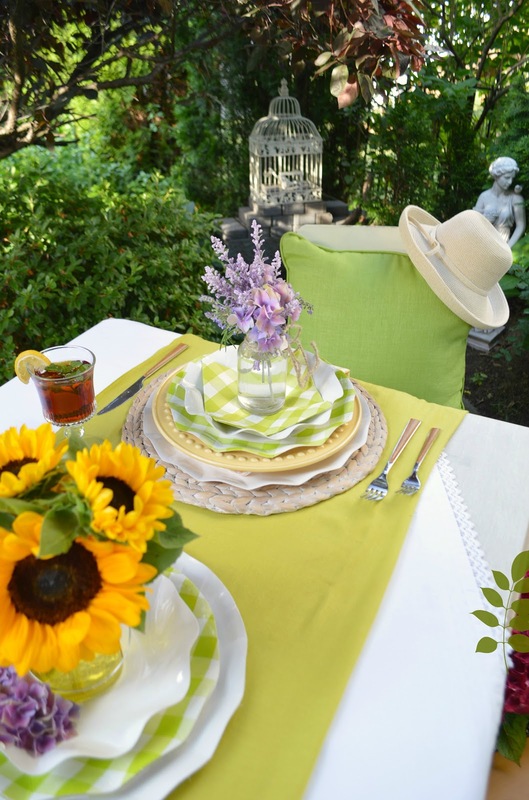 I also added a centerpiece with sunflowers to pickup the yellow of the plates at each place setting. A few decorative details and lush garden bring together my vision of a relaxed afternoon in the garden. I can see this table being set for a bridal shower, ladies luncheon, garden party or simply a gathering with a few favorite girlfriends. It is certainly a table I would want to gather around... Best of all, these plates are actually paper!!! Can you believe it? What do you think?? Can you see yourself using these for your next event?? Thank you for stopping by. Wishing you all a fabulous week. The products featured on this post were sent to me by Sophistiplate. However, all opinions are my own. What a wonderful table setting. I would feel like a Queen sitting there. You are so sweet!! Thank you. I would treat you like a queen if you were here. Wishing you a happy and blessed week. I have not heard of Sophistiplate. Thanks for introducing me. The ruffled gingham is bright green is really fresh looking. I also love the way you layered them with white and added touches of floral color in your beautiful tablescape. Thank you for visiting and leaving me your sweet comment. 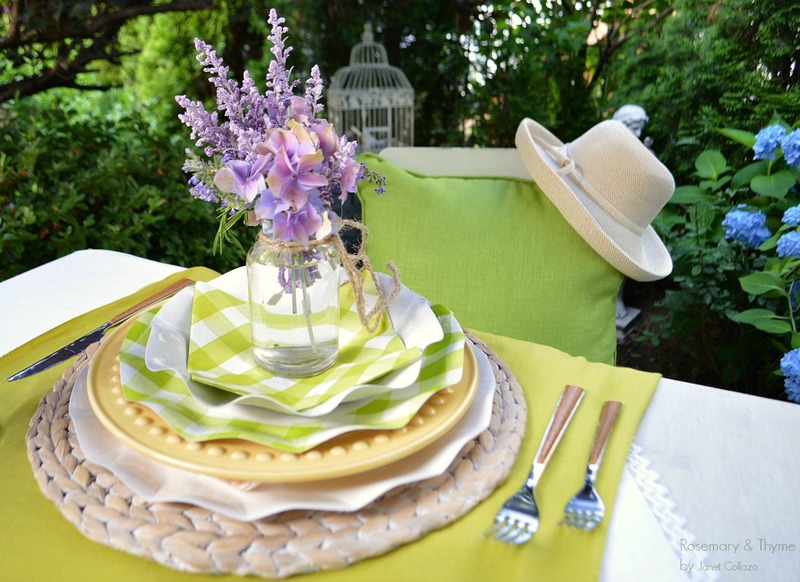 I agree, the ruffled green gingham plates give the table a fresh look. I always love looking at a beautiful tablesetting. Yours is so pretty. I love how the plates are so different. They are so versatile and will carry you to fall. Thank you for visiting and leaving me your sweet comment. I agree, the plates are very versatile and perfect for fall too. So happy to welcome you this week. Thank you so much. You are always so sweet. Hugs and blessings for you too sweet friend. Those are cute! Boy, paper products and melamine have really come a long way, haven't they?! See you on the hop this week. What a sweet surprise. Thank you so much for visiting. You are always so sweet. Yes, melamine and paper products are stepping it up these days. Those paper plates are so attractive, and I love your whole table set-up. Love the round placemats too. Beautiful summery table, loved it. Janet, when I saw this on Instagram, I could not believe it was paper. You did a beautiful job as always! 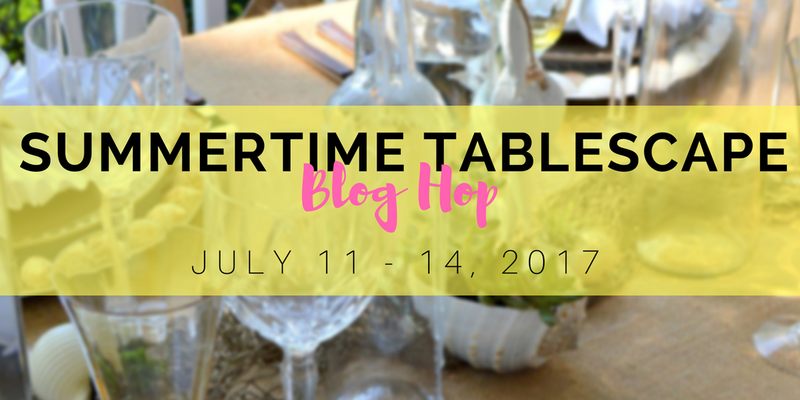 Looking forward to sharing the blog hop with you this week! Thanks for joining Gardens Galore! The inspiration that you have shared with us is beyond beautiful! The table setting, the shades of colors that you have used are all just yummy! Pinned this beauty too. This is such a fun and pretty tablescape. And you are right style doesn't have to be sacrificed because it is paper. It looks lovely and in keeping with the relaxed summer vibe! Thanks for sharing your beautiful table setting at Cooking and Crafting with J & J. Stunning table and the spot you chose is just perfect! Wonderful tablescape. I love the flowers at each setting. It's too darn hot here to do this .. but I can wish! Ha! I would feel very special sitting at this pretty table in such a lovely setting. Fun bloghop and Garden Party. 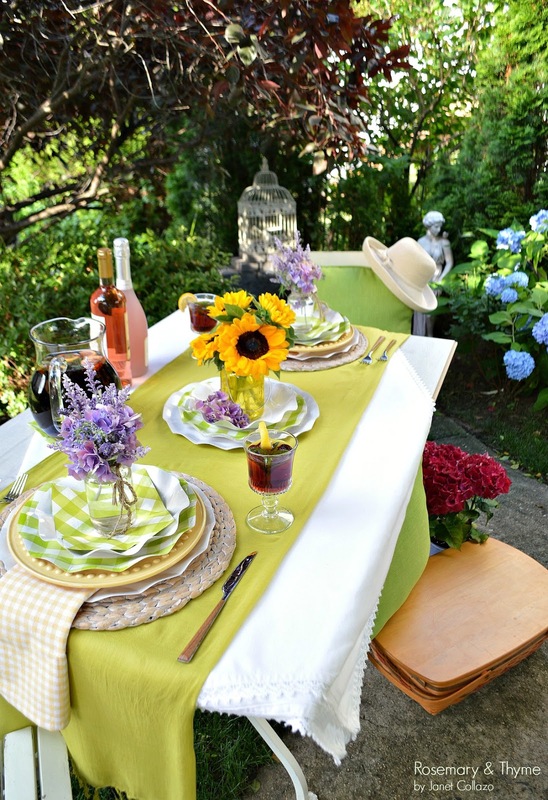 What a fresh and lovely table for spring and summer entertaining. You have a knack for pairing...it's perfect. Oh my I adore this tablescape! The paper plates are wonderful- who would imagine! Love the floral arrangements in the mason jars- just perfect!